This traditional area came to be when the walls protecting Ciutat Vella, Valencia’s old town, were demolished in 1865. After that, it was practically built from scratch with a great number of modern and stately buildings and the development of large, main roads lead to rapid urbanisation. Ensanche was created in the style of Barcelona’s Plan Cerdá; a grid-pattern design with large blocks and houses. The district of Ensanche was formed over three areas in accordance with the classification of Valencia City Council: Ruzafa, El Pla del Remei, and Gran Via. Due to Ruzafa’s historical background (it was an independent municipality until 1877) and the fact that it is notably different from El Pla del Remei and Gran Via, the latter two tend to be called just “Ensanche”. El Pla de Remei is one of Valencia’s most exclusive areas, covering from Calle Colón to Gran Vía Marqués del Turia and from Calle Ruzafa to the Turia Gardens. One can easily spot numerous modern-style buildings. Calle Colón is the most important commercial street in Valencia and is known for its shops and department stores, however, a multitude of stores can be found all over this area, as shown by Calle Cirilo Amorós and Calle Calle Jorge Juan. The Colón Market is a lovely example of modernist architecture. Declared a National Monument, it was completely renovated in 2003, transforming it into luxury shopping gallery. Gran Vía (the neighbourhood) forms a triangular shape, with Gran Vía Marques del Turia, Avenida Antic Regne de Valencia and Avenida Jacinto Benavente forming its sides. This neighbourhood is similar to El Pla del Remei with its modernist buildings and clear, grid-pattern blocks. There are a large number of private schools. Calle Conde Altea is famous for its plethora of restaurants, and there are enough here to serve the whole area. On Calle Salamanca, and particularly in the square closest to Plaza Cánovas del Castillo, there are many bars of all different types. Even though there is a lively nightlife, it does not compare with previous decades when closing times and licences were more permissive. Both Pla del Remei and Gran Vía are connected to the Turia Gardens. The origin of these gardens is astounding: after the Turia river burst its banks in 1957 and flooded Valencia, it was decided that the course of the river would be redirected towards the south, away from the city. This costly project lasted until 1972, but afterwards, the original riverbed around which Valencia was built was useless. It was decided that a park would be built, a green space for culture and leisure, that would cross the whole city. It was completed in 1986 and was named the largest urban park in Spain. The stretch of the Turia Gardens that lies in front of Ensanche is one of the most beautiful, and was designed by architect and town planner, Ricardo Bofill. The stretch is characterised by the pond that surrounds the imposing and historical Pont de la Mar bridge (built in 1591), by the large arabesque courtyard in the orange grove, and by the spectacular fountain situated in front of the Palau de la Música (Palace of Music). The Palace is one of the most memorable buildings in the city. 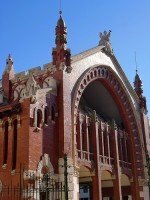 It is the auditorium headquarters of the Valencian Orchestra, and many concerts, expositions, and congresses are held here. During the summer months, it houses the Filmoteca D’Estiu; a giant screen showing a large programme of films, from new-releases to classics. As has already been said, numerous modernist and elegant buildings run the length of the neighbourhood. The Viennese modernist style of Sezession dominates the area, but it is also possible to find rationalism, gothic, eclecticism and art-deco styles. Without even realising, you find yourself surrounded by extraordinary and historical buildings: on Calle Sorní, los Dragones (the dragons) and the Cortina building are found. The concave shape of the Chapa (Sheet) building enhances Plaza Cánovas, and the Ferrer building is found on Calle Cirilo Amorós – many architectural examples of Valencian sophistication. Browse Ensanche property for sale listings.